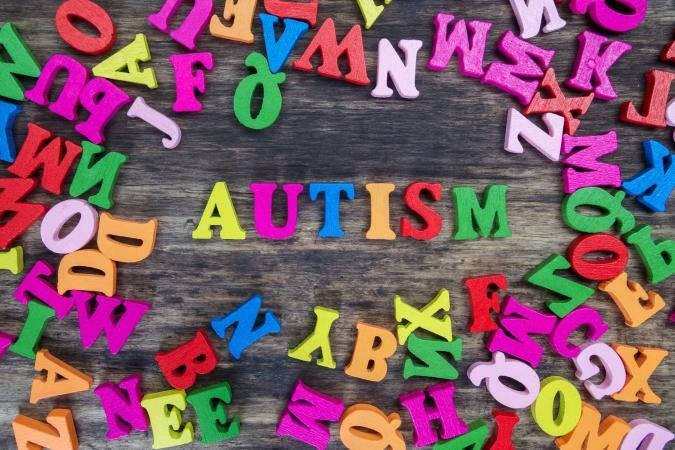 Although most children with autism are preschoolers when they receive an official diagnosis or educational label, they often show signs of an autism spectrum disorder (ASD) much earlier. Knowing the early signs can help you get much-needed therapy for your child, which may lead to a better outcome. 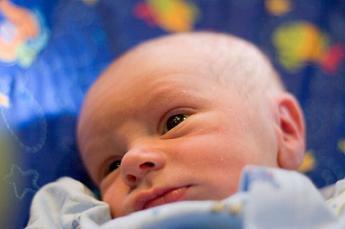 Certain symptoms may indicate an autism spectrum disorder in babies and toddlers. 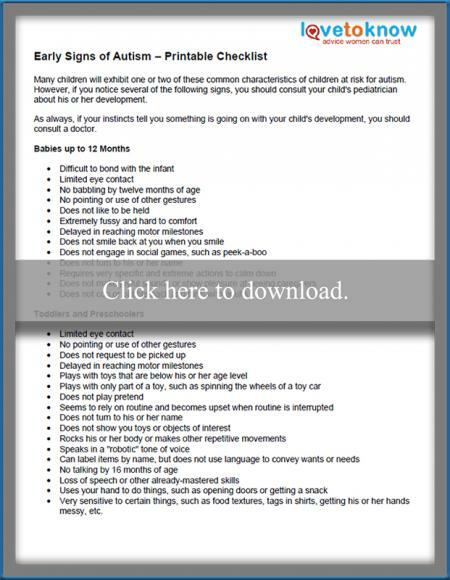 As you research this disorder, print this handy checklist of early autism symptoms to help you assess your child's development. If you need help downloading the printable, check out these helpful tips. You are probably already watching your baby's development and rejoicing as he or she meets milestones. However, you may also have concerns about your child's development. Even in babies under the age of 12 months, there are certain signs that may point to ASD. Most babies make repetitive consonant-vowel combinations, such as "ba-ba-ba" or "da-da-da," by about eight months of age. This is an important precursor to developing speech but for many children on the spectrum, this milestone is delayed. If your baby has not begun babbling by 12 months of age, consult your pediatrician for a developmental screening. If your baby is very active or fussy, he or she may go through periods where cuddling isn't at the top of the agenda. However, if your baby rarely likes to be held or does not enjoy your touch, he or she may have a type of sensory disorder. Often these sensory challenges go along with autism spectrum disorders. Similarly, sensory disorders can cause babies on the spectrum to be extremely fussy. If your infant cries constantly and you have ruled out other causes such as acid reflux, he or she may be over-sensitive or under-sensitive to stimuli in the environment. Sometimes, you may find you can calm your baby, but you must use very specific or extreme measures to do so. For instance, some parents report their child cries if taken from the infant swing, even for a moment. Typically, developing babies are fascinated by the human face. When you smile at them, they immediately smile back. However, infants at risk for autism sometimes don't engage in this "social smile." If your baby is approaching the age of 12 months and does not smile back at you or appear happy to see you when you enter the room, this may be something to discuss with your pediatrician. Many babies like social games like peek-a-boo. They also enjoy cooing or babbling in a sort of "conversation" with an adult caregiver. If you notice your baby doesn't engage in these activities, it can be a sign that your child is at risk for autism. Many parents of children on the spectrum report bonding presents a challenge. Sometimes, babies with ASD do not enjoy cuddling or being held. They may also avoid eye contact and even seem to ignore caregivers. These traits can interfere with the parent-child bond, at least at first. It's important to remember, however, all major autism research institutes, including the CDC, report your parenting style cannot cause your child's autism. MRIs are becoming more accurate at predicting the onset of autism based on the size of the cortical area. Studies have suggested children who are considered high risk for developing autism show a noted growth in their cortical area from the age of six to twelve months. This prediction was about 81 percent accurate when it came to diagnosing these children at 24 months old. In a study of six-month-olds, researchers found head lag during a pull to sit exercise was a high early predictor of autism. Children who showed this head lag were more likely to get the diagnosis by the time they turned three years old, in comparison to the control children. If your child shows unusual muscle weakness, be sure to speak with your pediatrician about it. As a child on the autism spectrum grows older, the signs of this disorder may become more apparent. Keep an eye out for some of these symptoms in toddlers and preschoolers. Sometimes, one of the ways children with autism spectrum disorders communicate and meet their needs is to use your hands like tools. These children may use your hand to open doors, get toys, or find a snack. This can be endearing, but it may also signal a problem with the child's development. If your child does this on a regular basis, consult your pediatrician. If your child does not speak any words by the age of 16 months, this may represent a speech delay. Although there are many reasons your child may have delayed speech such as simply being a "late talker" or struggling with the motor tasks of forming words, it's always important to consult a professional about your concerns. Many children on the spectrum have a speech delay, and a speech therapist can help your child make significant progress. If your child is talking but he or she speaks in a monotone, this may be a problem with prosody, or the natural inflection of words. This can be a challenge for many ASD kids, so it's important to check it out if the problem persists. Many children on the spectrum are very verbal. They may have great vocabularies, but they may not be able to use their words to get what they need. For instance, they may be able to label every body part or every vehicle they see, but they can't seem to ask for a snack or request that you pick them up. Toddlers on the autism spectrum often play with parts of toys, such as the wheels of a toy car or the door of a toy house. They may play with baby toys that are developmentally too young for them, or they may become fixated on household objects without understanding or being interested in their purpose. For example, a toddler with autism may love potholders but not have any interest their practical use. Additionally, typically developing toddlers and preschoolers are beginning to engage in pretend play, but children with ASD may show not interest in this activity. Another early symptom of autism is a lack of showing. Children on the spectrum often struggle with Theory of Mind, which is the idea different people have different perspectives. They may feel no need to show you a favorite toy or a new skill since they don't see your perspective as different from theirs. If your child never shows you things, consult your pediatrician about your concerns. 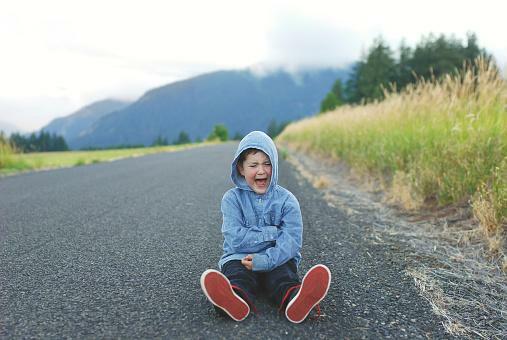 Moving in a repetitive way, often called "stimming," is a classic sign of an autism spectrum disorder, but this doesn't mean that every child who moves this way has autism. Repetitive movements might include rocking back and forth, flapping the hands, shaking the head, bouncing on the toes, shifting weight from foot to foot, and many others. If your child spends considerable time performing these repetitive movements, talk to a doctor or therapist. Most children seem to thrive on consistency but if your child has a melt down or is unable to function when the routine changes, this could indicate a problem. Children on the spectrum often rely heavily on established routines. They find these routines calming and reassuring and when they are altered, this can be a source of great stress. If you notice that your child experiences significant distress when routines change, this may be a cause for concern. Being particular about certain types of food is normal as a child matures. 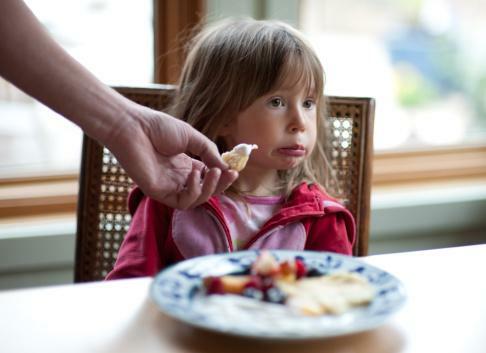 If your child has consistently been extremely picky or adverse to food because of its smell, texture, sound, and appearance, you may want to mention it to your pediatrician. Researchers suggest the pickiness has to do with sensory overload. 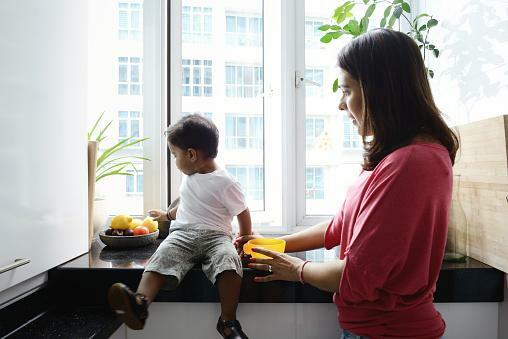 Whether your child is a baby or a toddler, there are a few other signs that may indicate a possible autism spectrum disorder. If you are concerned about any of the following signs, consult your pediatrician. For many children on the spectrum, meeting another person's eyes may be challenging. If you notice your baby or toddler resists eye contact on a regular basis, discuss your concerns with a doctor or therapist. Along with not showing toys or skills to other people, many children with autism don't point to objects or use gestures to communicate. They also may not follow a pointing finger to look at something. If you notice your child never uses gestures and does not seem to understand any of the gestures you use, this may indicate a developmental problem like ASD. Taken alone, motor delays are not a sign of autism. However, it's common for children on the spectrum to struggle with coordination, balance, and meeting motor milestones. Regardless of whether this indicates autism, you should talk to your doctor to get your child the therapy he or she needs to catch up. Many parents report their ASD children did not turn to look when their names were called. If you are constantly trying to get your child's attention and have to make loud noises or perform extreme behaviors to get the child to look at you, talk to your doctor right away. Any loss of milestones, whether they are motor, language, or social, is a cause for concern. If your child seems to forget how to speak or walk, for instance, contact your doctor immediately. Many children dislike certain foods or clothing items, but if your child has an extreme behavioral reaction to tags in T-shirts or food textures, he or she may have a sensory integration disorder. Other red flags include a very high tolerance for pain or cold, a dislike of being messy, a dramatic avoidance of certain sounds, and any other extreme reactions to ordinary stimuli. Especially if you're a first-time parent, it's natural to have concerns about your child's development. However, you should trust your parental instincts and consult a doctor about any developmental concerns you may have. Early intervention is an essential part of ensuring your child's future success, and it's always better to err on the side of caution. Don't wait to follow up on your concerns. The earlier you get help for your child, the better his or her chances of success will be. Be prepared for mixed reactions from other people. While some people will support your decision to pursue your concerns, others, possibly even your spouse or parents, may actively argue with you about your worry. Don't let this stop you from talking to a doctor. Your school district is another great resource if you're concerned about your child's development. Call a local school and ask for the number of the early intervention special education coordinator. This person will set up an appointment to assess your baby's development. According to the CDC, about one third of parents of children on the spectrum saw signs of autism in their child before he or she reached one year. Additionally, by the time their child reached the age of two, more than 80 percent of parents recognized early signs of autism. Remember that any concern you have about your child's development is valid, and you should always contact your doctor to help you determine whether autism is a possibility.